The Mueller Systems’ 420 RDM (remote disconnect meter) provides utilities with the opportunity to utilize existing meter boxes and piping configurations to install the only positive displacement meter on the market with an integrated shut off valve in a 7.5” laying length. Implementing this solution within the distribution system permits utilities to address move ins/move outs, delinquent accounts, and minimize interior damage in the event of broken pipes when residents aren’t home. The meter and system reduces the need for truck rolls and minimizes the utility’s carbon footprint………and now we provide multiple options for RDM activation with the Mi.Net system in either mobile or fixed network mode. See why our true two way system options provide more value than other systems on the market. The Hersey® RDM is a nutating disk, positive displacement meter that incorporates a radio controlled valve in a 7-1/2” laying length. The unique meter design allows utilities to retrofit 5/8” RDM meters in existing services where there is a high incidence of customer service call volume pertaining to transient or delinquent accounts, where employee safety may be a concern, or where it is difficult to gain access to meters. By accessing the account information through the Mi.Net™ AMI System User Interface screen, a radio frequency (RF) command can be initiated to turn on or off any service equipped with an RDM meter from any password protected computer authorized to access the utility site. positive displacement meters. Every 420 RDM no lead meter is compliant with the latest initiatives of NSF, ANSI and EPA standards. All electronic components utilized in the meter and RF transceiver design comply with applicable FCC, Part 15 standards and AWWA Standard C-707 for Encoded Remote Reading Systems. pilot valve; and RF transceiver. The maincase is made of no lead bronze for long life. Direction of flow arrows, model, and NSF-61 designation are permanently cast into the body components. The RDM is available with a plastic bottom cover only. The measuring chambers are designed for reduced wear during operation. The top and bottom of the measuring chamber, strainer, nutating disc and thrust roller are dimensionally stable thermoplastic which will not corrode. The electronic register housing and lid, Mi.Node and pilot valve housing are all made from thermoplastic. 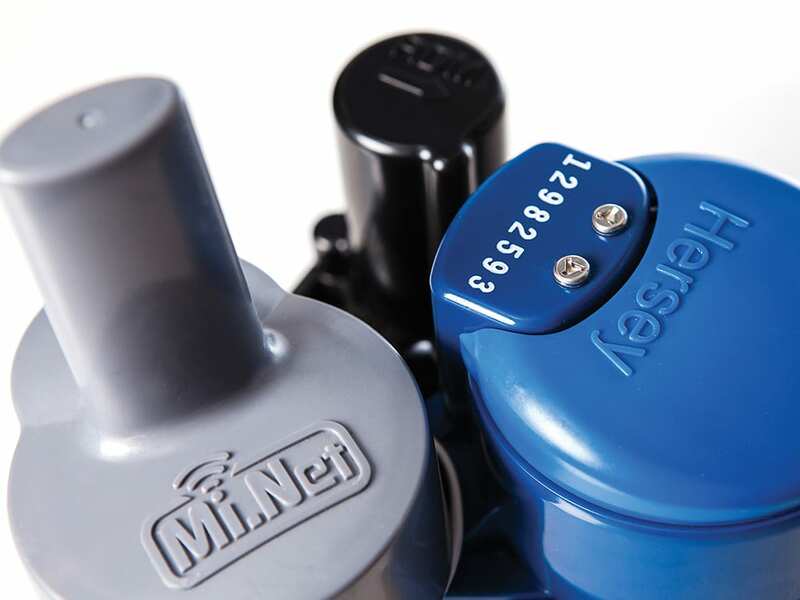 The meter is designed so that the register and pilot valve replacement components can be serviced easily without removing the meter from the line and are protected by Hersey’s unique tamper resistent locking pin and tamper resistent screw. Water flows through dual strainers in the pilot valve assembly. Differential pressure provides the operating principal for the valve activation. Water flows through the meter’s strainer where debris is screened out. The incoming water fills a known volume of the measuring chamber on one or the other side of a movable disc that separates the chamber into two sections. As water enters, it moves the disc (nutates), forcing a known volume of water out of the meter from the opposite side of the disc. The process repeats as the sections refill and empty in turn. The nutating action of the disc is coupled magnetically to the register to indicate the volume of water that passes through the meter. The pilot valve can be actuated via the User Interface from any web enabled device with the proper log in and password. System screens indicate the position of the valve (open or closed) and record the date and time for all valve activations providing a permanent record of each account’s history. components available include complete chamber assemblies and pilot valve repair kits when required. All components can be accessed without removing the meter from the service line for simplified maintenance.